I love this product because i drink coffee about six times a day. It is easy, and affordable to use. Im always on the go and always need my morning coffee to function. This is perfect for one person since it's a single serve. Although it needs maintenance every month, I learned that with my previous one. Especially if you tend to be a coffee aficionado. I brought this coffee maker for my dad, he wanted a coffee maker where he didn't have to brew a whole pot just for one cup. My dad isn't into electronics or technology, he's just a plain man who loves his sports & coffee. I knew that I had to find a coffee maker that was simple enough for him to use but would also brew him a great cup of coffee. My dad loved the sleek look, the simple functions, temperature of the coffee, and it filled his favorite coffee cup up perfectly. My dad loves making coffee now, I literally have to buy his K-Cups in bulk. LoL.. I would highly recommend this to any new comers to the k-cup world, it will help break you in just right. I use this Keurig every morning for the last three years. In the begining I was wonderful. It made a cup of coffee in the matter of minutes. Coffee tasted so good. I like it because it was a single. I am the only one in my house that drinks coffee so it worked for me. I like that it has a filter so you can add any coffee you want. The pods are good too, but it is expensive. There is no settings. Your measure your coffee add your water to the tank and brew. The one thing I didn't like was you have to use a certain size cup. It can not be tall. All in all its a good coffee pot. This is a great coffee machine. Coffee is really good and hot. I love the hot water dispenser for my teas and hot chocolate. It doesn't brew fast but it's not meant to be a fast machine. It's great when you start the machine and get ready for work. I have notice that I have to fill the water dispenser every two days. I just wish it had a larger water tank. But other than that I would,highly recommend this product. I've purchased a few as Christmas gifts for family and friends and they absolutely love them. I love my Keurig Mini Single-Cup Brewing System . I got mine a year or two ago for mothers day. The first thing I tried was hot cocoa and it was so good but different because I was used it hot cocoa being sweet and it was not. Then I got like a variety of coffee and teas. I love the teas more because I have not found the kind of coffee I like yet. I got mine in Red but wanted a blue or black color. I also bought a Reusable Coffee Filter. This is a thing you put in there you can put your owe kind of coffee in it . But you have to clean the filter out with every uses. You have to pop the other one out before using this one. My mom came over and she always drinks coffee and I made her a cup in my Keurig Mini Single-Cup Brewing System. She said this tastes really good an she asked where did I buy it from . Now ever time she comes over I make her the best coffee in the world in my keurig. She drinks more coffee in the winter. But I love ice coffee . Since I don't drink coffee that frequently, I really like using the Keurig Mini Single-Cup Brewing System to make my coffees. I don't think this is the best choice for someone who drinks multiple cups of coffee a day, but if you only drink a few cups a week, this is the perfect choice for you. 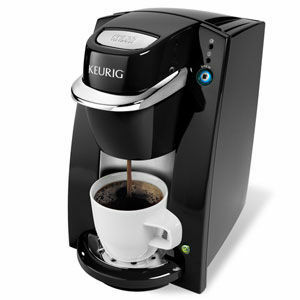 Although the larger Keurigs have a water storage tank, this one needs to be filled each time you make a coffee. In order to make sure I don't have more coffee than my cup will hold, I fill the cup I want to brew the coffee into with water. I then dump that water in the top of the Keurig before I start brewing the coffee. This is relatively easy to clean, as I just run thru a solution every so often to clean out the top of the Keurig. I know lots of people who don't even clean it out, but I try to do that once a month or so. 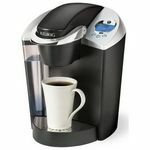 This is a great option for anyone who likes to drink coffee, but doesn't want the commitment of a larger sized Keurig. This looks nice on your counter and doesn't take up too much space. I got this one when they first came out with this brand and I loved it. 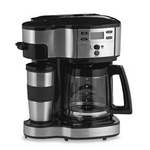 I used it primarily at work because it was much simpler to use than the regular coffee pot I had. This one is simple enough where it takes up virtually no space at all and it is quiet as a mouse when brewing. So much so, you never know when your cup of coffee started brewing and when it finished if you are not looking. Brew Performance This unit brews coffee super fast and very evenly. Ease of Cleaning This unit is very simple to clean. Each time I use it and simple give it a good rinse and it all good. Ease of Use This is probably the simplest unit to use of any coffee maker I have ever owned. Design The design of this unit is very sleek and simple. While is not very eye catching the look of this unit is very deceiving, because of the capabilities this unit has. Durability I used this unit every single day for 5 years and when I got another model and passed it on and it is still going strong for the person who i gave it to. I purchased the Keurig Single-Cup Brewing System for my cubicle at work when the office coffee maker broke. I had heard great things about this single cup brewing system and was excited to have a coffee maker at my desk, after all we all have those days where we pretty much need coffee on tap. I had a Keurig at my house that worked pretty well, so I purchased the mini version of it because I knew the brand and the quality. Overall, this coffee maker isn't one that I would buy again if given the opportunity. Brew Performance The brew performance is the big highlight for this brewing system. It makes the coffee relatively quickly, within moments in fact. While this may be worth it for some people, it wasn't the most important thing for me in a coffee maker. Ease of Cleaning I started having issues with cleaning this coffee maker a few weeks after I first bought it, and haven't stopped having issues with it. The inside of the water reservoir area is very hard to clean out, and I find that it smells and the smell is relatively hard to get rid of. Ease of Use The coffee maker is easy to use, and just requires two steps, besides pressing the start button, to make the coffee. Design I thought that this brewing system was relatively large for being a mini. I eventually took it off my desk and moved it to the common area because it took up too much space. Durability The coffee maker felt rather cheap for the price, in regards to the materials used. 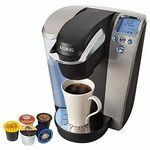 This little single serve coffee maker is not only quick and convenient, it is also a way to get your own personalized cup of coffee every time you brew a cup. 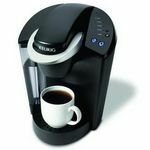 If you like regular plain coffee it will do that, but if you are a person who enjoys various flavors in their daily coffee routine this brewer is perfect for you. Your spouse can have their cup of dark roast morning java, while you enjoy a delicious hazelnut flavored cup of bliss. 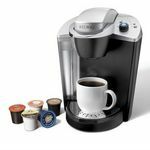 While everyone in the household or office can choose exactly what flavor or roast of coffee they want, the Keurig Mini Single-Cup has the added benefit of no wasted coffee. Serving coffee one cup at a time means not having to toss out half a pot at the end of the day. It's also eco-friendly since there is no wasted water as well. You add enough water for one cup of coffee at a time so no need to empty a reservoir at the end of the day. The quality construction ensures this unit will function properly for a long time. The space saving size also doesn't take up more counter space than many of the other single-serve brewers on the market. It's easy to clean and while the brewing process isn't silent, it doesn't create as much noise as some other coffee makers I've tried. Overall, this is my favorite way to brew coffee since one person can enjoy flavored coffee or even hot tea while another gets themselves a cup of their favorite roast. The only drawback is the fact that it only brews one cup at a time so if you are serving a crowd it may take awhile to get everyone their coffee, but each cup will be personalized to their taste and come out fresh and hot. Brew Performance Fairly quiet and a quick brew. Ease of Cleaning Wipes down easily. Ease of Use Pour a cup of water in the unit, add your favorite single serve cup and hit the on button.